Beaming live from Edinburgh’s Fourth One studios, FOMO (the fear of missing out) is a talkback radio programme with a twist. Australian actress Zoe McDonald is in the house, cleverly subverting radio-based theatricality and creating an immersive site specific experience for her exclusive audience of listeners. Well-structured and appropriately audience centric the work has enormous potential and succeeds primarily because of the acting abilities of McDonald herself. 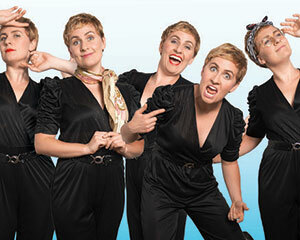 Playing an array of twelve characters this is a quirky production that has at its core a very talented performer who can seamlessly segue between the very different guests on her show as well as her d-list celebrity co-host and zen producer. Audiences are questioned about their own relationship with FOMO, are sung to, danced with and encouraged more than anything else to be present to the number of eccentric personalities on the show whose insights will at least inform, if not accelerate your decision to cut out a certain amount of technology-driven dictates that consume our world. The conversations are occasionally quite hilarious, especially when the vajazzling beautician reappears, and of course there is the bogan Australian as well. With only a few available spaces in this fully functional studio there is little option but to become involved with the charismatic McDonald and go along with the ride. Little room for movement but within the constraints of the space the show works exceedingly well. There are some very good jokes, a few awkward references that feel out of place and of course headphones. There is something quite special about having a presenter voice right in your ears but it’s not new and while which an alluring aspect of radio theatre it unfortunately end being rather gimmicky. While McDonald is an unquestionable talent to anchor yourself into this show the actual writing seems a bit muddled and meanders more than necessary. Plenty of irreverent humour and some wonderful impersonations but a few script tweak wouldn’t go amiss.